With the birth of the tatami mat room indoor life became comfortable. Inside the room landscapes and pictures of birds, flowers and the beauties of nature were painted on sliding doors and walls, so that people's thoughts turned to nature. Flowers were also arranged and their freshness enjoyed. 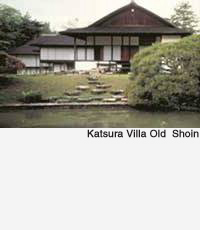 Then a verandah (en) that was open to the outside was built on to the zashiki. Above the verandah there was a roof that jutted out a long way, protecting it from rain. Another verandah was built on a lower level than the first one. This was called a nure-en ('wet verandah'), as it was built outside the shutters. The floor of the room extended smoothly out in stages. The Chinese character for en ( ) can also be read as 'fuchi' which means border or edge. Also the phrase ' ' (goen ga arimasu ne) means to have a connection or a common destiny with someone. As well as being a dividing point between house and garden, the en also joins the house to nature. The floor of the room is extended to touch and connect with the garden. This is the harmony with nature that the structure of the Japanese house encourages and the verandah plays the leading role in this.